I became a fan of Pat Conroy after reading Beach Music in 1995. In every novel, he masterfully weaves an intricate web of tales with southern charm and lyrical description ― exploring the fragility of the human mind and soul, the searing pain of tragedy and the healing power of unexpected joy. For Conroy, all roads lead to home. South Carolina. Set against the lush backdrop of Charleston, South of Broad unravels an unforgettable tale of families haunted and broken by tragedy, their closely guarded secrets that become exposed, and the everpresent menace of racism and class division looming beneath the surface. Conroy’s protagonist and narrator is Leopold (Leo) Bloom King, the unassuming ringleader of a group of high school outcasts who sustain each other in good times and in bad, more the latter than the former. Their stories intertwine over a period of two decades, at the end of which they face their most daunting challenge which is the ultimate test of their friendship. 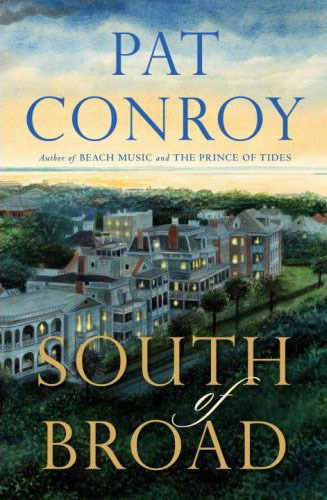 South of Broad is an exquisite, eloquently written ode, both to Conroy’s beloved hometown of Charleston and to the gift of lifelong friendships born and nurtured from these southern roots. I was enchanted from beginning to end and read the book in one sitting. If you haven’t read any Pat Conroy’s novels, I would heartily recommend this as your first taste of this very gifted storyteller. * adapted into a film (1991) by the same name, directed by Barbra Streisand (she also starred in it), Nick Nolte and Blythe Danner. ** adapted into a feature film (1983) by the same name, starring David Keith. *** adapted into a film (1979) by the same name, starring Robert Duvall. **** adapted into the 1974 feature film, titled Conrack, starring Jon Voight and then later (in 2006) adapted into a TV movie, under the book’s original title, and starring Jeff Hephner. This entry was posted in heatherfromthegrove, inspiration, lessons learned, literati, other musings and tagged author, Barbra Streisand, Beach Music, Blythe Danner, books, Charleston, Conrack, David Keith, fiction, Heather Joan Marinos, Heather Marinos, heatherfromthegrove, heatherfromthegrove's story spotlight for today: "South of Broad" by Pat Conroy, Jeff Hephner, Jon Voight, My Losing Season, My Reading Life, Nick Nolte, novel, Pat Conroy, reading room, Robert Duvall, South Carolina, South of Broad, summer reading, The Boo, The Great Santini, The Lords of Discipline, The Prince of Tides, The Water is Wide, Writer. Bookmark the permalink.